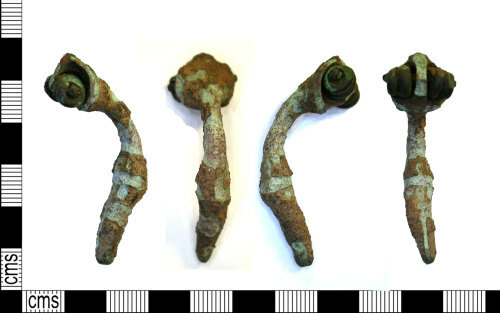 Roman copper alloy trumpet brooch, Length: 45 mm, width: 14 mm, weight: 10.54 g.
The brooch is corroded and missing its pin and base. It has a spring of three coils attached to its circular shaped tapering headplate. The circular cross sectioned bow is decorated with very worn mouldings.